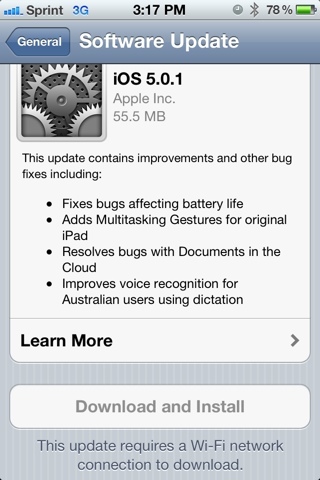 Apple today released iOS 5।0।1 for the iOS devices. The update is an over the air update so you don't need a PC, but you do need a WiFi connection. This could could be an inconvenience for users that don't have immediate access to a WiFi network।Without the WiFi connection, the download link was not selectable। Once I connected to WiFi I was able to download and install itI did have a hiccup during the download. My wife called me on the phone during the download and it failed; however, it continued after the call had ended. 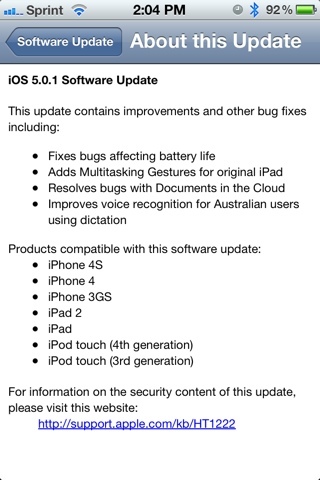 Since WiFi was being used, it should not have failed so it may have been an issue because many others were updating their devices too।The update is intended to fix the poorer than expected battery life for some iPhone 4s users।It fixed some issues with Documents in iCloud.Siri issues with Australian speaking uses.It added gestures support for the generation 1 iPad devices.I'll report back to let you know if my battery life improves and how the gestures work on my iPad 1. The whole process took 25-30 minutes.